Mopane (Colophospermum mopane) plants form monotypic woodlands that cover extensive areas in northern Botswana. Mopane is also a principal food item in the diet of elephants. Obtrusive damage to mopane plants as a result of elephant feeding may alter the structure of mopane woodlands. Some mopane woodland areas in northern Botswana are subjected to heavy elephant utilization rates whereas other mopane areas are less affected. However, the underlying reason for the concentrated elephant utilization is unknown. Ten mopane plots were subjected to sampling of soil properties that included structure, pH, nitrogen, phosphorus, potassium contents and protein contents. Elevated nitrogen and phosphorus contents in soils correlated with high protein levels in mopane leaves. Protein levels in leaves of mopane plants differed significantly between sites. However, multivariate analyses of environmental parameters and plots suggested that on a regional scale, there was no difference in the extent of elephant damage to mopane plants due to differential protein levels in leaves or any of the underlying soi factors that were examined. From management perspective, this pattern mitigates the likelihood that an even more prolific elephant population will alter mopane woodland habitats irreversibly. The distribution range of elephant populations in southern Africa where elephants are not restricted by humans largely overlaps with the distribution of mopane (Colophospermum mopane) woodlands. Mopane is a principal food item in the diet of elephants, not only in northern Botswana , but also elsewhere in southern Africa [4, 20, 28, 30]. High utilization rates of plants by prolific elephant population may result with the alteration of vegetation structure and even the decline of species diversity . Some mopane woodland areas in northern Botswana appear to sustain higher elephant utilization rates than neighbouring mopane areas. The availability of water from surface seasonal water sources can only partially explain the distribution of elephant browsing [1, 31]. Two findings relating to factors that affect the feeding habits of other large herbivores suggest possible additional explanations for the patchy browsing by elephants on mopane. First, large herbivorous species are influenced by elevated nutrient concentrations in the forage [7, 24]. And second, the feeding patterns and the differential distribution range of large herbivores can be explained by localized differences in soil factors and nutrient levels in the forage [5, 22]. The elephant population in northern Botswana has been growing steadily over the past two decades [8, 21]. Already, some reports cautioned against the spread of excessive elephant damage to woodlands [15, 23, 27]. This risk gives practical urgency to identifying the factors that determine the pattern in which food – in this case mopane – is used by elephants. In particular, we seek to test here whether high mopane utilization by elephants is predicted by the higher nutrient qualities of either mopane itself or of the soil on which it grows. In tackling this question we assume that if elephants showed selective feeding in northern Botswana, then elephants would also display feeding preferences within a principal and abundant food source. Analysis of variance for the independent parameters measured in each plot revealed high variations of variables related to soil properties and vegetation structure, but low variation in leaf protein contents (Table 1). Mean values and standard deviations for variables describing soil properties, plant densities, and extent of elephant utilization in Mopane woodlands of northern Botswana. 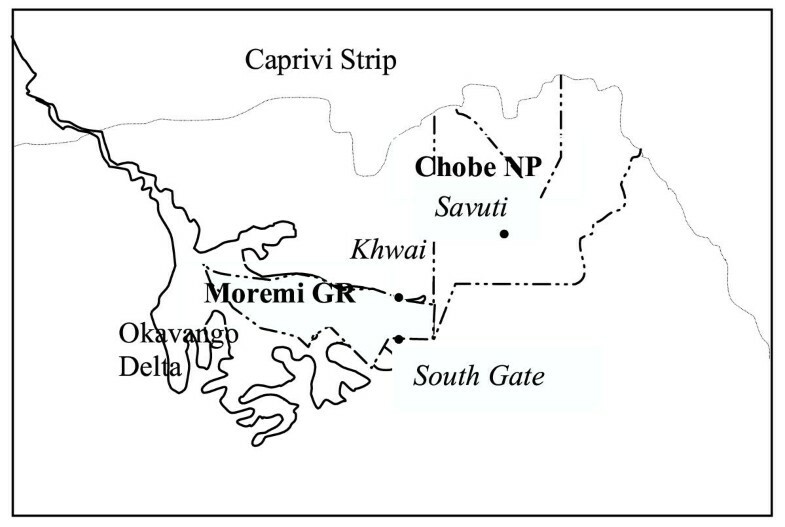 Figure 2 describes the influence of the geographical position of plots on the levels of protein in mopane leaves. Although the range of leaf protein was narrow across the plots (10.2–13.5%), it is possible to distinguish apart between 3 different clusters of points representing plots that correspond to separate sites selected for the analysis. Accordingly, Savuti had the lowest protein contents in leaves. 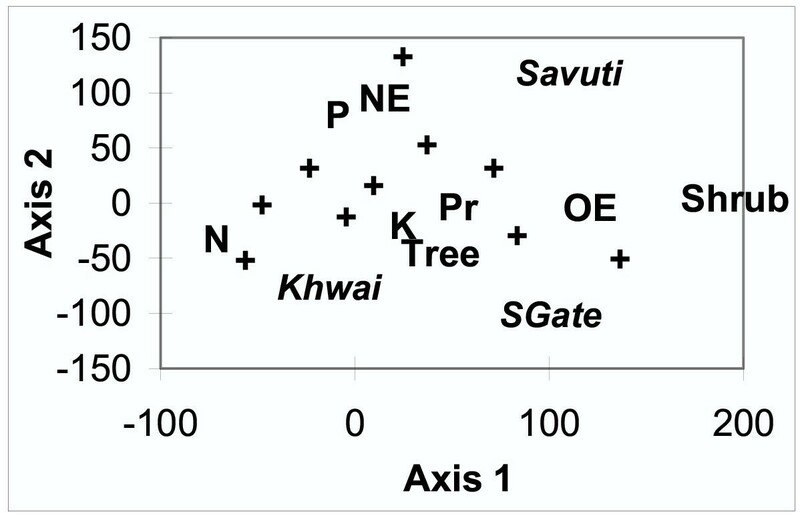 South Gate dominated the medium range and plots of the Khwai River site had the highest protein contents in mopane leaves. 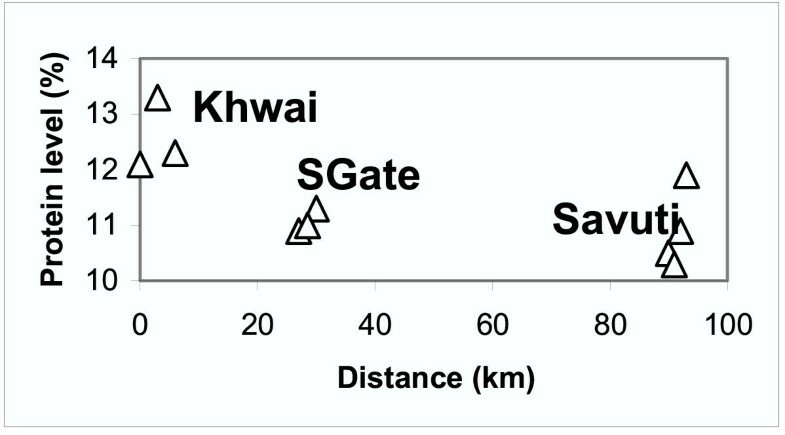 Multiple comparisons indicated significant differences between the sites (T = 2.96, α = 0.05), except for Savuti and South Gate. Protein levels in mopane leaves in relation to the distance between sampling plots from one threshold plot at 0 distance at the Khwai area. Further multiple comparisons indicated that the densities of shrubs did not differ significantly between the three sites. Similarly, the extent of new elephant damage to mopane plants did not differ significantly between the sites. Tree densities and the extent of old elephant damage however, differed significantly only between Savuti and South Gate. The match between the two observations can be explained in that mature trees showed signs of past elephant utilization. Levels of phosphorus in the soils did not differ significantly between the sites. Potassium levels differed significantly between the Savuti and Khwai sites. Soil nitrogen levels differed significantly between the three sites except for Savuti and South Gate (T = 2.96, α = 0.05). The matrix of variables incorporated for the multivariate analyses included 10 rows (each representing the 10 individual plots) and 8 columns (each representing one environmental parameter). The environmental parameters were tree densities, shrub densities, nitrogen (N), potassium (K) and phosphorus (P) contents of soils, protein contents of mopane leaves (Pr), densities of mopane shrubs and trees in plots, and new (NE) and old elephant damage (OE) to mopane plants. Figure 3 provides the summary analysis of these parameters. The ordination of the first principal axes described 90.2% of the variation in the analysis. However, the test of Monte Carlo permutations indicated that the associations between variables representing plots and environmental parameters were not significant (P = 0.11). The geographical classification of sites related to clusters of neighbouring plots was retained to some extent in the analysis. Plots in the Savuti area however, showed a wide dispersal range along the principal axes due to high variability among the parameters examined. Although protein levels in mopane leaves differed between plots the differences did not add much to the overall variation in the analysis. The proximity of the point representing protein levels to the origin of the two principal axes indicates that there were poor associations between elevated protein levels in mopane leaves and high elephant damage to mopane plants or any other variable included in the analysis. The first two axes of cannonical correlations representing mopane plots and environmental parameters. Plots are marked with +, and general locations are indicated. Environmental parameters:Shrub: density of shrubs.Tree: density of trees.OE: old elephant damage. NE: new elephant damage.Pr: protein contents in leaves.K: potassium contents in soils. N: nitrogen contents in soils.P: phosphorus contents in soils. A breakdown of associations between variables to linear correlations between pairs of variables revealed only two significant correlations among the environmental variables measured. The associations described elevated soil nitrogen and potassium levels with increasing protein contents in mopane leaves (R2 = 0.68 and 0.64, P = 0.002 and 0.04 respectively). A simple assumption would be that herbivores maximize their energy intake by selecting the most nutritious food items available within their home range. In reality however, this assumption is confounded by many ecological factors that reduce the energy return of potentially nutritious feed items. We already know that mopane woodlands are principal food items for elephants in northern Botswana and that the proximity of water sources also influences feeding patterns . These two factors were imbedded a priori in the sampling design in an attempt to assess the magnitude of other factors that may influence the choice of food sources by elephants. The physiognomic diversity of mopane woodlands that vary from dense stands of shrubs to scattered tall canopied trees was not explained by either of soil factors examined. Nonetheless, soil factors seem to affect leaf chemical composition. High protein levels in mopane leaves correlated with elevated levels of nitrogen and phosphorus in the soils. Although nutrient intake by plants is generally independent of concentrations in the supporting substrate, this pattern suggests that mopane plants in some areas accumulate more nutrients than mopane plants elsewhere in northern Botswana. These differences were evident when comparing between mopane plots that were situated more than 30 kilometers apart. The question is whether the differential nutrient levels in mopane leaves influence the feeding patterns of elephants? Local soil properties, shrub and tree densities and protein levels in mopane leaves appear not influence elephants' choice of feeding sites dominated by mopane. Thus, the seemly patchy distribution of elephant utilization of mopane shrubs in northern Botswana was not corroborated by the results. It seems that the differences in protein levels are too subtle as far as the elephants are concerned, or do not offset other factors, such as distance to permanent water sources and the proximity of other food sources. Furthermore, other chemical properties in leaves, such as carbohydrate content and secondary chemicals that inhibit digestion may influence elephant feeding habits than initially perceived. The importance of mopane plants as a food source for elephants cannot be underestimated in northern Botswana where woodlands grow on much of the dry land area. The resilience of mopane both in terms of survival rates of individual plants and recovery of biomass was demonstrated before [2, 3]. Yet, some mopane woodland areas in the region are utilized intensively by elephants and damage to these adds credence to support the notion that a prolific elephant population in some parts of the region may be so numerous as to become unsustainable by local woodland habitats. The results presented here indicated that elephants appear not to differentiate between areas with respect to the protein contents of mopane leaves. This to some extent diminishes the likelihood that elephants will concentrate feeding in a particular (high protein) area until they exhaust the available resources and destroy the vegetation in the process. Therefore, in contrast to early concerns, areas that are currently heavily utilized are unlikely to be further decimated by elephants. Insofar as this finding indicates a certain component of stability to the northern Botswana ecosystem . In this study, northern Botswana is defined as an area of more than 80,000 km2 between 18° and 21° south and 21° and 26° east, but excluding the permanent swamps of the Okavango Delta. Rainfall ranges from 400 mm in the south and 650 mm in the north-east. Rains occur during the summer from October to April and mainly in heavy storms. Temperatures vary between monthly mean maximum of 34° (October) and a mean minimum of 6°-7° (June) (Bhalotra 1987) . The topography of the area is very flat and the altitude is around 950 m asl. The north easterly elongated Goha and Shinamba Hills, which rise to 150 m above the surrounding plain, form the only significant topographical feature. The area is covered with deep deposits of aeolian and alluvial sands and silts of the Kalahari beds. These soils are generally neutral or slightly acid, poor in nutrients, poorly structured and with low water holding capacity. More fertile vertisols and Molapo soils are mainly found on flood plains and in some depressions. The bedrock consists mainly of Karoo sediments, material of the Ganzi, Kwebe and Damara formations and granitoid gneisses of the old basement complex. Bedrock is exposed in the eastern and south-eastern parts of Botswana where the sand cover is thin. In the northern, central and western parts, solid rock is obscured by loosely consolidated deposits, known collectively as the Kalahari Beds, which attain thickness of 300 m or more . Most of the area is covered by tree and shrub savanna, towards the north, changing into woodland and to dry deciduous forest with Baikiaea plurijuga dominating in the Chobe area while the south is dominated by shrub savanna, rich in Acacia species. Low lying areas and the edge of flood plains are often dominated by mopane woodlands. The relationship between soil factors, mopane plants and elephant utilization of plants was examined in 10 plots located in 3 sites within Chobe National Park and Moremi Game Reserve in northern Botswana, namely South Gate, the Khwai River and Savuti. To include a measure of the spatial relationships between plots, we chose one plot at the Khwai site to represent a benchmark point and measured the distances of the rest of the plots from that plot. The distance between plots situated within a site varied from 1 to 7 kilometers. Plots were allocated to cover as much as possible the existing regional range in soil properties, judged by the appearance of soil colour and texture. To override the influence of surface water as a source for the attraction of elephants, all plots were not situated further than 10 kilometers away from a permanent water source. Additional criteria for the allocation of plots included varying densities and physiognomic forms of mopane plants and evidence of elephant damage to plants. The position of the 3 sites followed a regional stratification to vegetation communities  and also the annual estimates of elephant densities [21, 10]. In each plot, squares of 10 × 10 m were allocated within two elongated rectangular areas that were parallel to the direction and on each side of a nearby track. The size of each plot varied with respect to the density of the mopane plants within. In all, the size of plots did not exceed 500 × 300 m. The number of squares per plot was determined after conducting an analysis of variance for plots where at least 150 squares were sampled. The allocation of squares within a plot was not contiguous to assure the independent status of squares . Sampling took place during the middle of the dry season (August) when herbivores are expected to be more selective and also to offset variations in the concentrations of minerals in mopane leaves because of seasonal fluctuations . In each square, the number of woody plants of the respective dominating species belonging to specific height classes was counted. Height classes ascribed for shrubs (>1 and <3 m) and trees (>10 m) were represented in terms of the mean number of plants/1002 m (Table 1). The category of shrubs included fallen trees, the individual branches of which were considered as shrubs if the size criteria were met. Multi-stemmed plants with stem diameters of less than 6 cm were treated as a single shrub unless a gap wider than the width of 10 cm could be distinguished between the stems. Trees were defined as plants with a stem diameter of 6 cm or more and higher than 3 m. Woody plants that corresponded to the definition of a tree and had several stems that were jointed close to the ground were considered as one tree. In all, 9,858 mopane plants were sampled. The frequency of mopane plants utilized by elephants in the assigned plots was recorded in addition to the estimation of vegetation structure. Damage to woody plants as a result of elephant activity was estimated for individual plants within each square as being as either new or old elephant damage, or both. New damage is that which had occurred since the recent rainy season. Damage becomes characteristically greyish in colour after rain soaks into the exposed inner plant parts. Damage in this context is not only excessive vegetation destruction, but is all easily noticeable utilization of woody material. Only damage that was positively attributed to elephants was recorded. Hence, damage was estimated in terms of the number of mopane shrubs utilized per square of 10 × 10 m .
Thirty soil samples were taken from the woodland plots in locations that were thought to represent the typical features of each plot, such as within tall tree stands, dense shrub formations, near plants that sustained high or low elephant utilization. Ten soil samples were taken within an area of 300 × 150 m to investigate the local variation in soil properties in one mopane woodland site. All samples were taken from 5 to 10 cm below the surface that represented the horizon at which plant root development is substantial [12, 20]. Each soil sample was subjected to five tests that included soil texture composition, pH and contents of nitrogen, phosphorus and potassium using a sampling kit . The proportions of sand, silt and clay were derived by particle composition analysis using soil separation tubes and texture dispersing reagents . Soil pH was determined through saturating the samples in a Tricon flocculating solution and indicator. Soil extracts were utilized for the determination of nitrogen, phosphorus and potassium contents . Reagents for nitrogen included sodium bisulphate monohydrate sulfanilamide and ammonium sulphate. Stannous chloride, sodium molybdate and potassium chloride solutions indicated phosphorus levels. Sodium nitrite and sodium cobaltinitrite were the principal reagents for the extraction of potassium. Mopane leaves were sampled in each of the selected 10 plots. Crude protein was extracted from leaves of 40 to 50 mopane shrubs in each plot. To eliminate the seasonal effects on protein levels, the leaves were cut within the span of a few days during the dry season. The leaves were cut from shrubs between 1–3 meter height. The reasoning behind the selection of this particular height range is because elephants prefer to feed upon mopane shrubs and less from trees and seedlings . Total nitrogen was determined after a wet digestion with sulphuric acid, by the Kjeldahl method . The method does not separate between the organic and inorganic quantities of nitrogen (mostly in the form of nitrate) in leaves. However, it is unlikely that under conditions of low soil nitrogen and ample light in northern Botswana that plants accumulate large quantities of inorganic nitrogen and that these quantities vary significantly between the different areas. Records of soil properties, leaf protein, plant densities and number of plants utilized by elephants were subjected to ANOVA, primarily to examine the extent of variation within a sampling plot . A multivariate analysis provided a comparative measure for the variance between records of individual plots. The analysis produced an overview of the associations between plots and variables related to soil properties, vegetation structure, and elephant utilization. Canonical correspondence analysis , an eigenvector ordination technique for displaying variables in a two-way contingency table was used to generate ordination axes. These axes are linear combinations of a matrix in which plots were represented by columns of categories for soil properties, densities of shrubs and trees, and elephant damage. The matrix of variables consisted of eight rows representing each sampling plot. A Monte Carlo permutation test examined the significance of the first canonical ordination axis. Essentially, the test identified whether the associations between plots and environmental parameters were significant. The results of multivariate analyses were complemented by multiple comparisons and linear regression analyses . The former compared between the mean values derived for plots and sites (T critical = 2.96, α = 0.05). Several multivariate analyses were performed on the same data set to examine the stability of associations between variables before deriving the final results. The analyses included Detrended Correspondence Analysis, Principal Component Analysis and Canonical Correlations . Canonical Corrections with symmetric scaling of variables provided the optimal presentation of variables although the arrangement of variables along the principal axes remained consistent with the other analyses performed . Location of three sites in northern Botswana where variables related to soil factors, mopane plants and elephant utilization rates were recorded. RBS thanks the Office of the President and the Department of Wildlife and National Parks for a permission to do this research. RBS thanks P. Gadilmang and M. Bathami for their enthusiastic assistance in the collection of data. We thank Dr. Steven Hill for constructive advice. This project was funded by the National Geographic Society. RBS conducted a 10 years study on the ecology of elephants in northern Botswana and drafted the manuscript. DWM conducted many studies on the behaviour and ecology of carnivores and large herbivores.